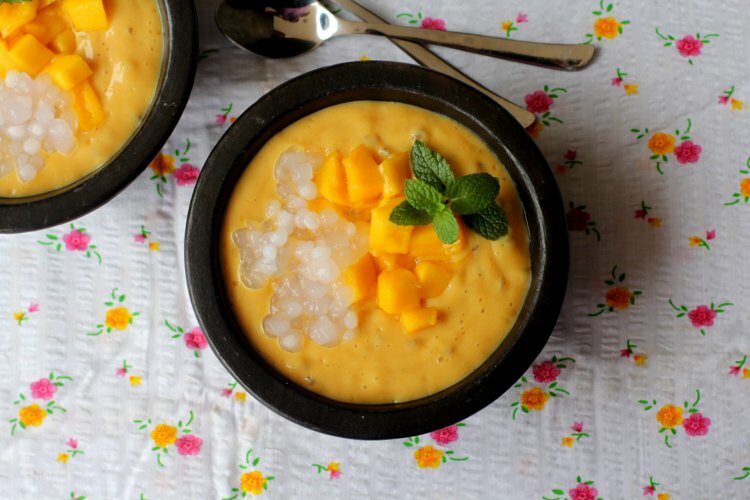 Mango sago is a delicious, addictive pudding made with fresh mango pulp and tapioca pearls. 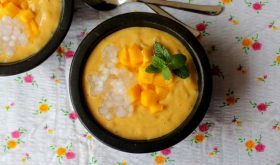 There are many versions to the basic mango sago recipe based on the region its prepared especially in South Asian countries like Singapore, Thailand or Hong Kong. 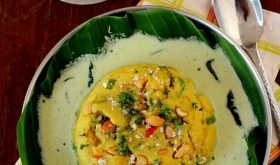 Coconut milk and palm sugar are usually an integral part of this classic mango dessert but I have used dairy and replaced palm sugar with normal white sugar. 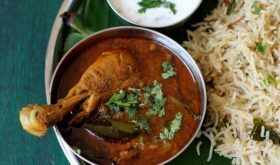 This easy mango sweet dish has a light, fluffy, creamy texture bursting with mango flavor and a sutble aroma of cardamom. One of the easiest mango desserts that is refreshing, smooth, creamy and perfect to beat the heat. 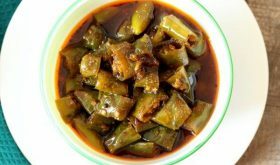 This pudding has my favorite fruit go into its making and am so glad that I made it before the mango season ends in my part of the world. 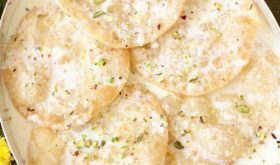 One of the main ingredients of this eggless dessert is tapioca pearls or sago aka sabudana which is made from gluten free tapioca starch and comes in different sizes. I have used the large size tapioca pearls which I washed thoroughly and soaked in water for 20 minutes. After they have been soaked, I washed and boiled the sago in lots of water till the pearls turned transparent yet held shape. The creamy texture of mango sago pudding contrasts perfectly with the chewy texture of soft tapioca pearls. 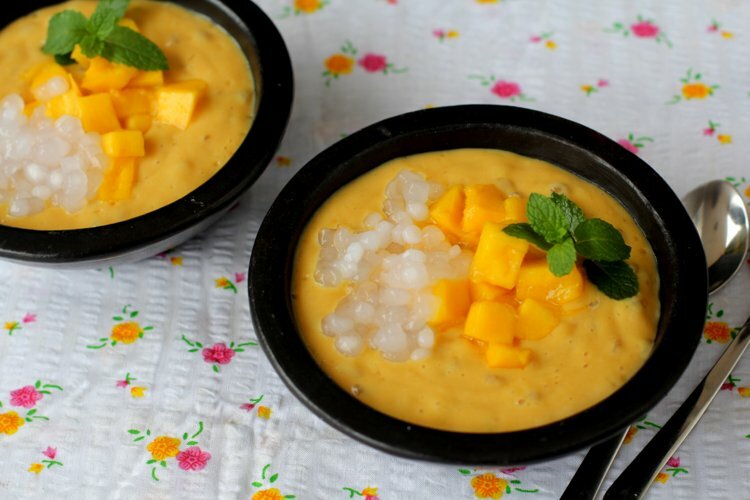 Instead of going for that boxed pudding mix for your next party, do consider serving this delicious mango sago dessert to your friends and family. 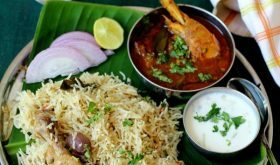 You can easily make this eggfree pudding ahead of time and nothing beats homemade desserts made with fresh ingredients and loads of love. By Sailu Published: July 8, 2015 Mango sago recipe, an easy eggless mango pudding made with mango pulp & tapioca pearls. 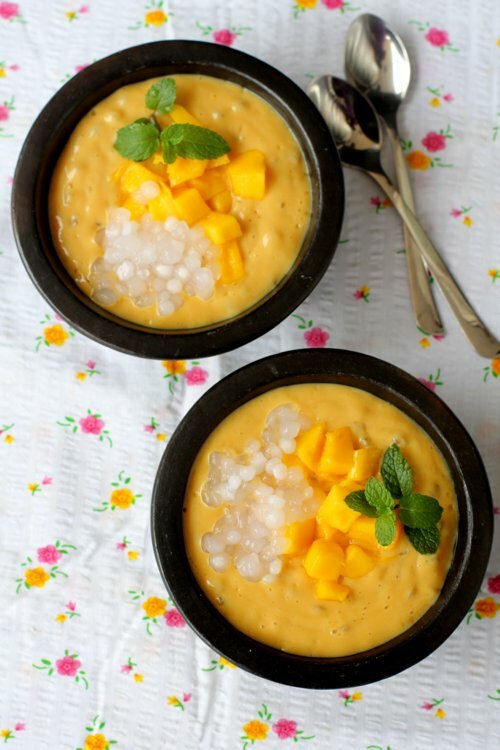 How to make mango sago dessert, a gem among mango dessert recipes.